R.O.C. stands for (Resources, Organizations and Community). The Summit for Soldiers Music Festival is for our Community to give back, For our Resources to Share, and for our Veterans to feel appreciated. For All Others: Dinner by Donation, T-Shirts and other Merchandise for Sale. This is the signature event and fundraiser put on by Summit for Soldiers 501c3 Veterans Non-Profit Organization. ROC stands for "Resources" "Organizations" and "Community" and is intended to connect veterans and their families to some of the many Ohio resources that are available to them. It is also our way of saying "Thank You" to those who have served this country by providing them a free and exciting evening of entertainment. 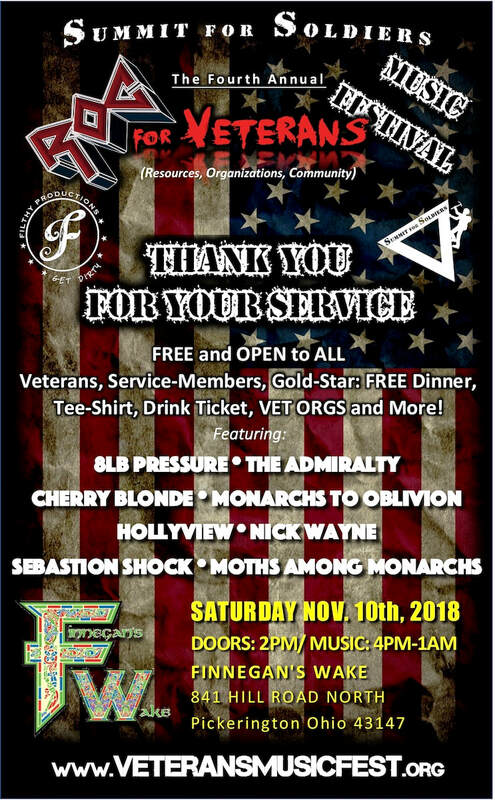 The idea behind ROC is that there are several resources and organizations that many veterans and their families may never have even heard of, so by inviting these organizations to come set up at our Summit for Soldiers "ROC for Veterans Music Festival". Summit for Soldiers is a peer-to-peer veterans organization on a mission of Suicide Prevention, that utilizes Outdoor Adventures and activities as a platform to build a network of camaraderie and support for veterans struggling with PTSD, TBI and Suicide. Our mission is to remove veterans from the "isolation" that often leads to some of the 8000 veterans suicides each year, and to show them that they are not alone in their struggles, but together we can walk the road together.